NYC Alert: Route 495/Lincoln Tunnel Construction - Expect MAJOR Delays thru 2021! We will post CWW Alerts on this page as events warrant. 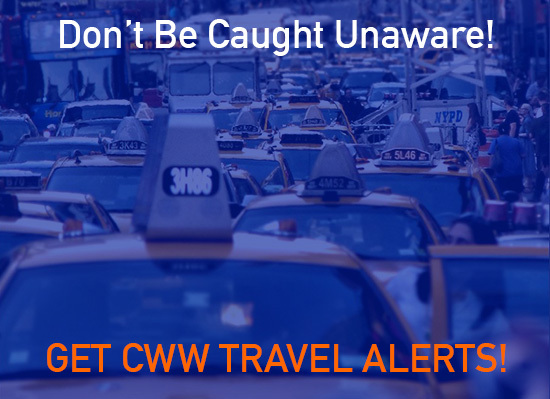 If you have subscribed to CWW Alerts, we will send them directly to you via email as well. Alerts may include airport advisories, major traffic issues, severe weather warnings or any other matter which may cause any inconvenience to our valued clients or cause any disruption of service to you. Don't see a link to your favorite city? Let us know and we'll add it for you! Get CWW traffic and storm alerts, airport advisories and more delivered to your inbox!